Two Brockenhurst College students won awards at the regional SkillBuild competition last month. Twenty-three-year-old Jake Williams from Southampton won third place in Advanced Carpentry, and 22-year old Morgan Mitchell from Romsey won first place in New Entrant Joinery. 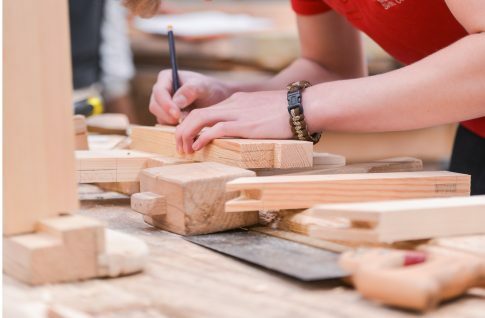 SkillBuild, delivered by the Construction Industry Training Board (CITB), is the largest multi-trade competition in the UK for construction trainees and apprentices. A series of competitions sees the most talented learners compete against each other to be crowned a winner in their chosen craft. Altogether, six Brock students, who train at the College’s Marchwood Skills Centre, participated in the competition at the Greater Brighton MET. Entrants were tested not only on their technical abilities but on their time management, character and commitment. Jake and Morgan now await the decision on whether they will be selected for the three-day UK SkillBuild National Final in Birmingham in November. Winners from the final may then get the opportunity to represent the UK in an international skills competition known as WorldSkills.